A few months ago, Brownstoner had a post wondering about the status of the Quadriad site on Bedford and North 3rd. Things were looking awfully quiet at the time, but shortly thereafter, work picked up. And they certainly have made progress since then – this morning, for the first time, the concrete and rebar could be seen sticking out above the sidewalk bridge. (Hard to see in this photo from a foggy morning, but beyond that orange netting is actual rebar rising to the sky). 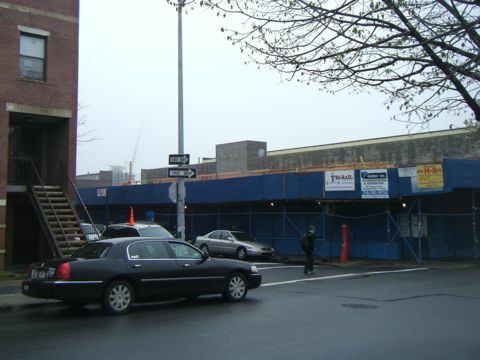 Yet another project to add to the “still here” list of development projects in North Brooklyn. Given all the doom and gloom, its nice to see (certainly nicer than a derelict site or a permanent eyesore, like, say, the site immediately to the north). Given the size of that hole, I suspect they have something more in mind than 4-6 stories. The amount of parking on the approved plan seems extreme for the number of dwellings as well. These guys definitely seem capable of manipulating the system, so I watch (every day) with great trepidation. Not saying I’d prefer a vacant lot, but I don’t think they’re trustworthy and I don’t think the DOB is capable of overseeing people like them.